Alison was born with brain damage and athetoid cerebral palsy, a condition which keeps her body in constant motion and affects her speech and coordination. Her parents were told she would never walk or talk, let alone lead an independent life. But Alison made herself an expert at overcoming odds. She learned to walk by the age of six and was talking at age seven. The one thing Alison wanted more than anything was to be independent and so she arrived at National Star full of optimism and determination. She studied English, mathematics, cookery, sport and typing. By 1980, National Star had 100 students. Thanks to the development of Wilson Court (then the new Octagonal Court) and other additional accommodation, students no longer lived in dormitories but had their own rooms. Alison first lived in Wilson Court and then Lake House, which was used as a residence. In 1981, Alison was featured in the first of two BBC TV programmes about her life. The first followed her time at National Star and her challenge of getting work and learning to drive her beloved Mini. She went on to receive a diploma in youth and community work. In 1987 Alison married Vicar, Mark John. They have two children and Alison is now a proud grandmother. 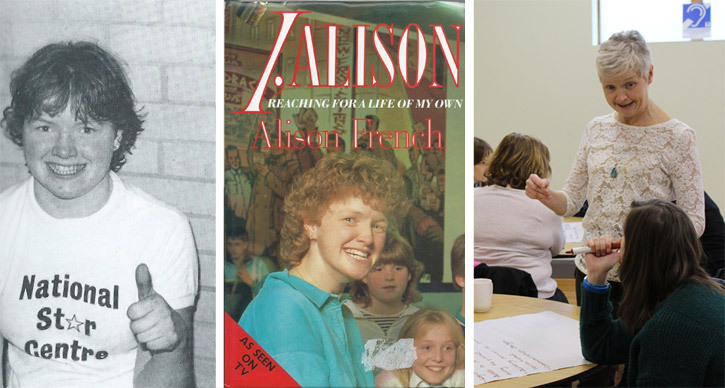 In 1999, Alison set up Alison John & Associates, delivering Disability Awareness and Challenging Disablism training.